Ask anyone who has visited the island of Roatan if they have heard the words banana and donuts mentioned in the same sentence. Although this is an unusual combination, it is not all that uncommon in the highly frequented tourist area of West Bay Beach. 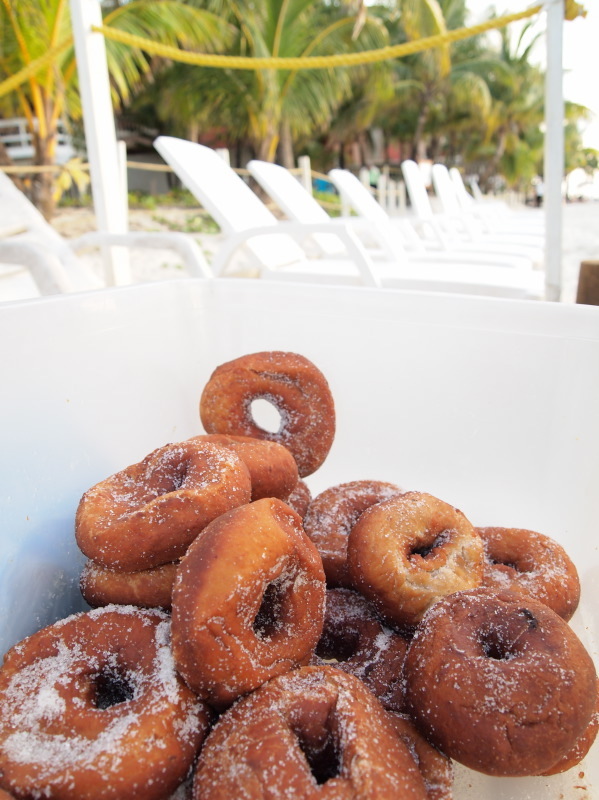 So if you are one of those curious travelers who loves to try authentic local products and decided to satisfy your sweet tooth with this tropical version of the small fried cake of sweetened dough in the shape of a ring, otherwise known as a the Banana Donut, we hope you find this article noteworthy. However, if you came and went and you did not a have taste of this popular West Bay snack we are sorry to say you did not have the full West Bay beach experience; thus, allow us at GBCA to introduce you to this eccentric West Bay personality that is sure to sweeten your vacation next time you come to visit. 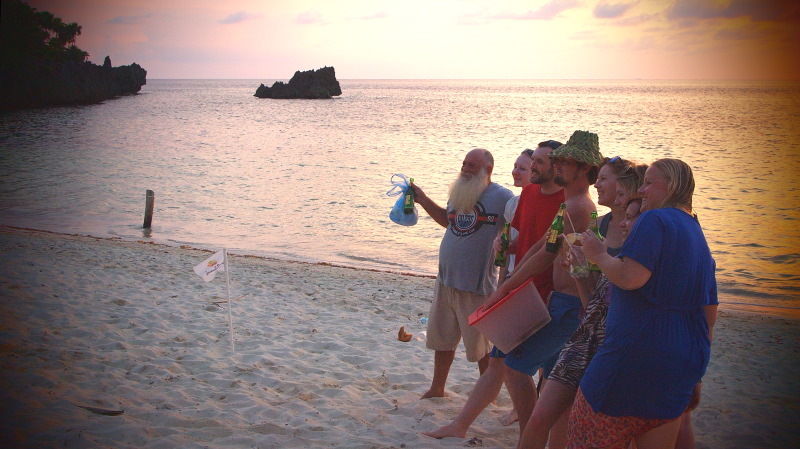 With his straw hat, white Santa Claus-like beard, and his melodic voice calling out the words “Banaaaana Donuts”, this guy can be spotted all the way out from the reef! 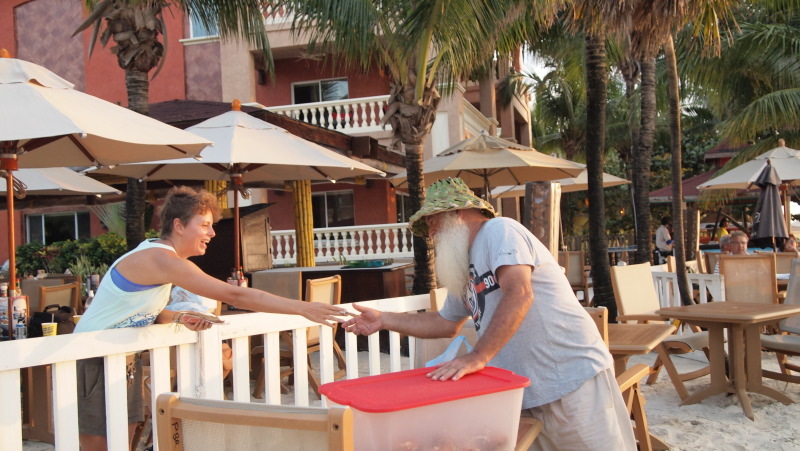 His craft is distributing fresh sugarcoated donuts to the multiple beachgoers vacationing in this part of Roatan. His name is Milton Herrera Romero but everyone knows him as Banana Donuts Guy. 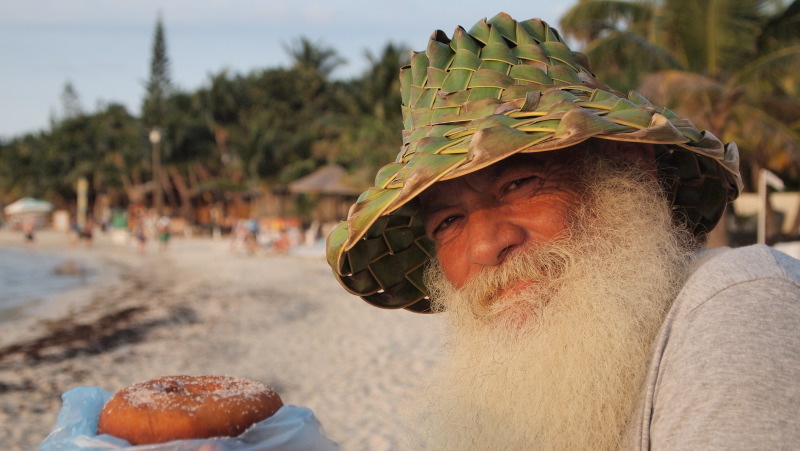 He is a studied man with a degree in Public Administration, who fell in love with the island lifestyle, and decided to make his hobby of selling donuts, his way of life, and in the process help you kiss your diet goodbye. Known to strike up a convers ation with just about anyone in the vicinity, this extroverted but well-mannered gentleman is out to make friends with the help of a large box filled with his world famous banana donuts. 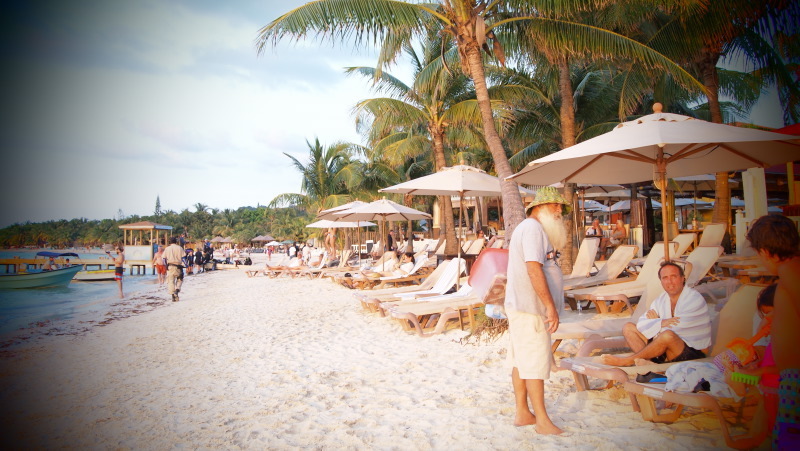 We are not kidding with the world famous adjective, the guy get hugs and kisses from repeat visitors from all over the world as he trudges slowly up and down the beach. He even has T-shirts that were designed personally for him by some of his Canadian fans. Of course, there is a theme song too, with lyrics that says, “Banana Donuts, Banana Donuts – is standing on the beach”. There is also the rumor that there is a poster of Banana Donuts Guy at the Montreal airport inviting travelers to come down to Roatan and try his outstanding donuts. If you still do not believe us, do a Banana Donut Guy search on Google or YouTube and see for yourself. His donuts occasionally vary in taste with the addition of seasonal fruit like mango or pineapple, not to mention rum, coffee and chocolate. Of course the island flavor that is responsible for his donuts’ critical acclaim, is the Honduran Banana. These soft texture donuts are made with special care by his wife, and are prepared hygienically with the use of 14 different ingredients, including ripe banana, coconut milk, and a light coating of sugar. 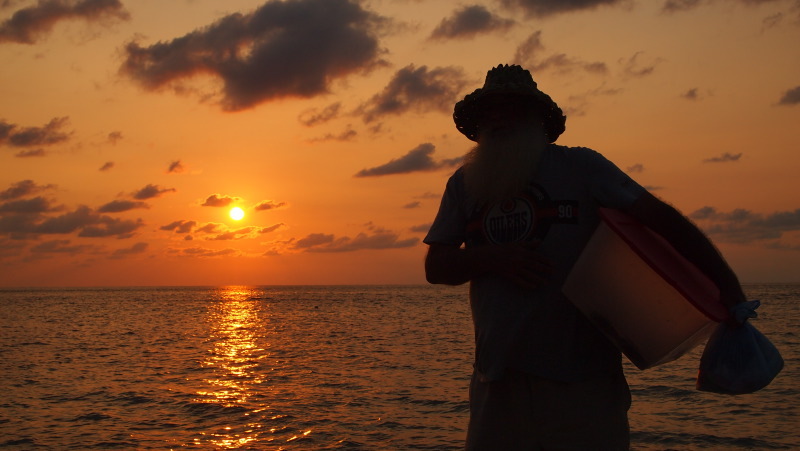 Banana Donuts Guy is easy to find, he hangs mostly up and down the beach in West Bay from around 10:30am until noon, only to return at 3:00pm until the sun sets or by the time he gets to the end of West Bay right by the rocks, where he usually runs out of donuts. 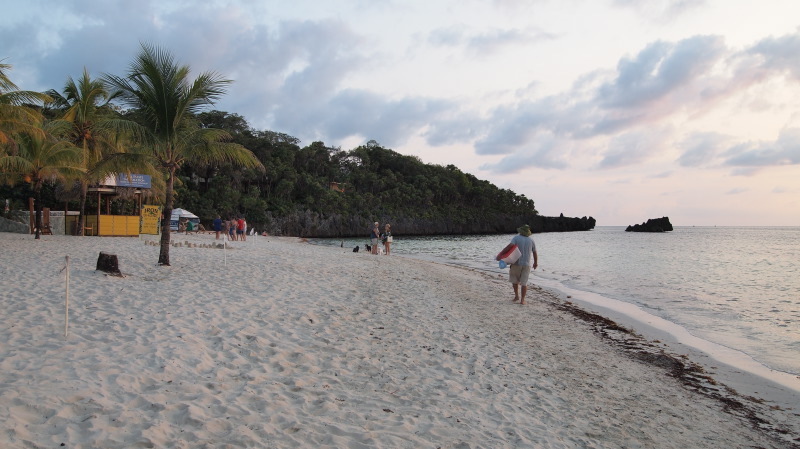 Seldom he moves on to West End, the Port of Roatan, or the airport when it is slow season on the island. So next time you are in West Bay, look for this charismatic soul that will surely remind you that life is sweet at the beach. He will try his best to get you to indulge in a donut eating frenzy, most likely you will leave with three, you just remember to take a selfie with the one and only Banana Donuts Guy, and perhaps you can be famous too. To learn more about Banana Donuts Guy, check out his nomination page at http://www.gobluecentralamerica.org. Hogs, Pelicans, and Roatan Banks!